It's pretty much guaranteed that a lie in with a cup of tea or coffee being served at some much later stage would suffice on Mother's Day (I know it would for me) however, if you want to treat your Mum or Grandmother, aunty or friend who you think of as a Mum, we have come across some lovely things. Some of us like to make a massive fuss and others prefer to give something more token, hopefully we've covered the spectrum here. A bit like the Christmas gift guide, I could be accused of using this post as a brazen list of things I'd like but, being honest, it worked out nicely in my favour last time so, why not? The message is clear on this one and who doesn't always need a handy pen? The You're doing great biro is a sweet token and says it all, clear as day, so she doesn't forget. Holly & Co., £2. "Cactus, cayenne & marigold inspired by Frida Kahlo - zingy, warming finish strewn with edible yellow marigold petals. What does a cactus taste like you might ask? Imagine green bananas with a hint of citrus and you're not far off". Also it's Creighton's chocolate, enough said! £4. It's great getting post but when it's a beautifully packaged box of beauty treats to dropping through the door, it's extra special. £30 for a three-month subscription. I'm a massive fan of pasta but not the biggest cooking fan. What do you give someone like me? 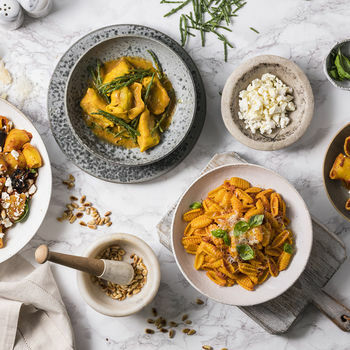 A Pasta subscription! It's £87.50 so a lot for pasta however, it is for two people and it means not having to remember to buy the ingredients 5 times and also could be an ongoing thank you, "date night" / "cook for mum night" for over a month! I've persuaded myself I need this. Pasta Evangelists via Not on the High Street. Yes, we are fans of the Posh Totty gifts and especially this workshop. Great for the "experience" gift - why not go and learn how to make a ring? It's £120 but that's for two of you to enjoy the day. I always enjoy a trip to Burwash Manor. Normally you can take the children along but on this occasion, when you visit Dragonfly Beauty Spa, leave them at home to really enjoy the time. If you want to spoil someone, you could buy a voucher or specific treatment for her at this quiet upstairs spot. While she is being pampered you can potter in the shops and then meet up afterwards for some food at Flock Cafe. From 2017 by my daughter. If all else fails and you don't get round to buying anything, a homemade card from the children, a pretty bunch of spring flowers and a lazy morning together make the most perfect Mother's Day gift we can think of.